From the makers of the hit game Cookie Jam, comes a NEW calorie-free treat, Cookie Jam Blast! 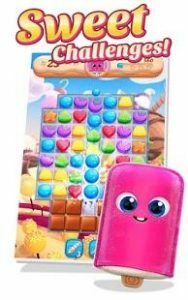 With delicious new challenges and game modes, this game is sure to satisfy! Oh la la! Make matches to move the cupcake towards it’s box! Get it out for delivery! Quick, get the Topplers! Make matches next to a Toppler before they move! Capture them all to win! Actually if people try different levels they will see it’s quite different than typical match three games. It’s fun, and I like the variety of boards!